In a 121-page order, U.S. District Judge Thomas Zilly directed a leather-cleaning company to reimburse The Times for environmental cleanup costs, but also criticized The Times for failing to do enough to address environmental problems at the former Troy Laundry property it sold to a developer in 2011. 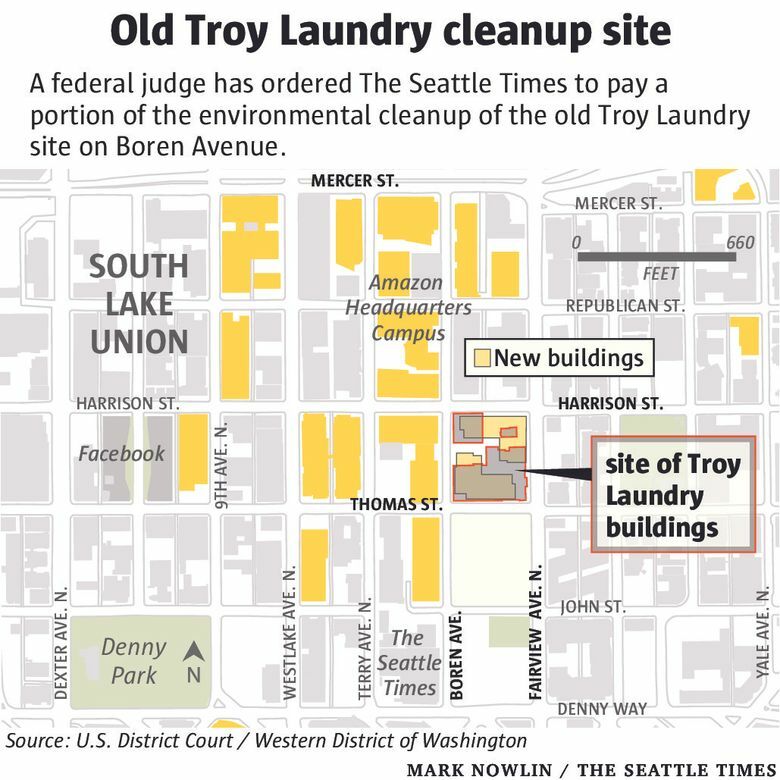 A federal judge has held The Seattle Times and a leather-cleaning company responsible for environmental cleanup costs paid by a developer who bought contaminated property The Times once owned by Troy Laundry. 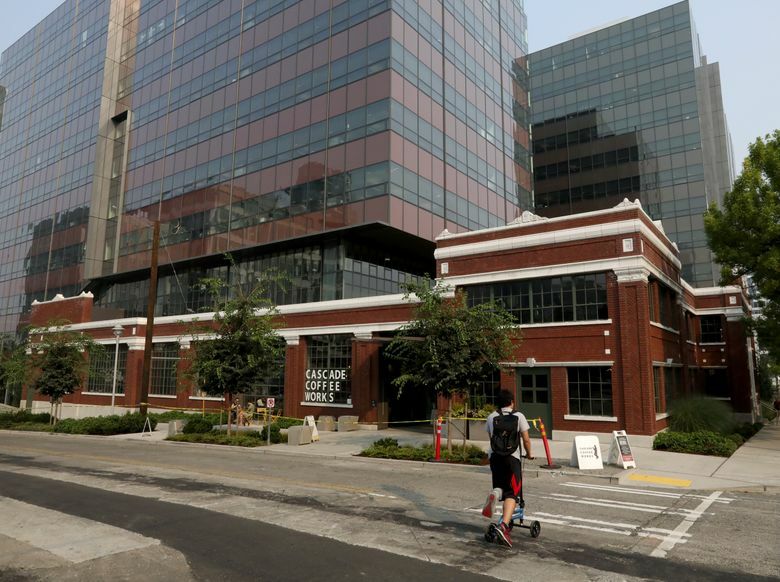 In a 121-page ruling released Aug. 15, U.S. Judge Thomas Zilly found the developer, Touchstone, was owed more than $8 million in costs to cleanup at the South Lake Union site. Of that amount, the judge found LeatherCare, which leased space at the site, was responsible for $5.4 million of the costs and the Times for the remaining $2.9 million. Since The Times had already paid the developer $4.8 million in cleanup costs under a contractual agreement when the property was sold, the judge directed LeatherCare to pay the Times the difference of $1.8 million. The Times bought the property in 1985 from Troy, which for decades operated industrial and retail dry-cleaning operations that ultimately left the soil contaminated with hazardous substances and petroleum products, including PCE, a synthetic chemical listed by the U.S. Environmental Protection Agency as likely to be cancer causing. The Times acquired the property just north of its then-offices at Fairview Avenue and John Street to expand its printing operations, although that didn’t materialize. It sold the property for $18.4 million in 2011 to Touchstone, which redeveloped the site into a commercial complex with two towers after hiring contractors to excavate and transport more than 100,000 tons of contaminated soil to waste facilities and installing injection wells to deal with groundwater contamination. Even before Zilly’s ruling, The Times paid Touchstone $4,783,434 for the environmental remediation under a contract between the two. Remaining issues resulted in litigation involving The Times, Touchstone and LeatherCare, which offers wholesale leather and suede cleaning to dry cleaners throughout Washington and Oregon and which for years leased space from Troy and The Times. Zilly presided over an 18-day bench trial earlier this year. In his 121-page findings, Zilly found that Troy, now defunct, and LeatherCare were equally at fault for the pollution, even if there were few environmental standards governing the industry when PCE was commonly used as a solvent. 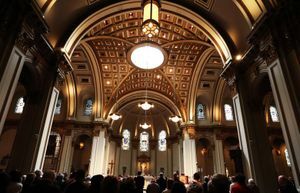 He also found that systems used at the property were generally considered state-of-the-art. “In the absence of other involved entities, and if Troy was still solvent, the Court would hold Troy and LeatherCare each 50 percent liable for the remedial action costs; however, the facts of this case are not so simple,” Zilly wrote. Troy can’t be sued because The Times released it from legal liability, Zilly noted. Moreover, The Times, in contrast to LeatherCare’s six-year period of PCE use, owned the property for more than 25 years, the judge found. During most of that period, The Times “took few corrective actions” during most of its more than 25 years of ownership and allowed PCE plumes to “travel farther and deeper into the subsurface soil, reaching the adjacent right of way and the groundwater,” Zilly wrote. “Although Seattle Times did not play an active role in the original contamination, it is no less culpable than Troy and LeatherCare, particularly given (i) its knowledge at the relevant times that the Property had been or was being used as a dry-cleaning facility, (ii) its failure to conduct any meaningful investigation prior to purchasing the property, (iii) its inadequate exploration after acquiring the Property, and (iv) its insufficient efforts at remediation,” Zilly wrote. Despite being advised in 1985 by a consultant about the possibility of “slow leaks” from underground tanks, The Times didn’t notify the state Ecology Department and “took no steps to heed such warnings,” Zilly added in a footnote. Alan Fisco, president of The Seattle Times, said the company’s legal team is still working on a detailed analysis of Zilly’s decision. “This was a very complex case, as was the decision. 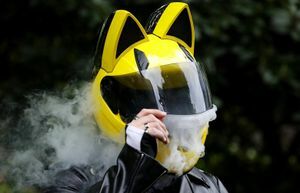 As a result, I will not be able to answer all your questions,” Fisco said in an email. Fisco said The Times closed on the purchase of the property in early 1985 and used it for storage and parking company vehicles for a number of years. He said it was during the completion of the sales process to Touchstone that the company learned the extent of contamination issues that happened before the purchase. 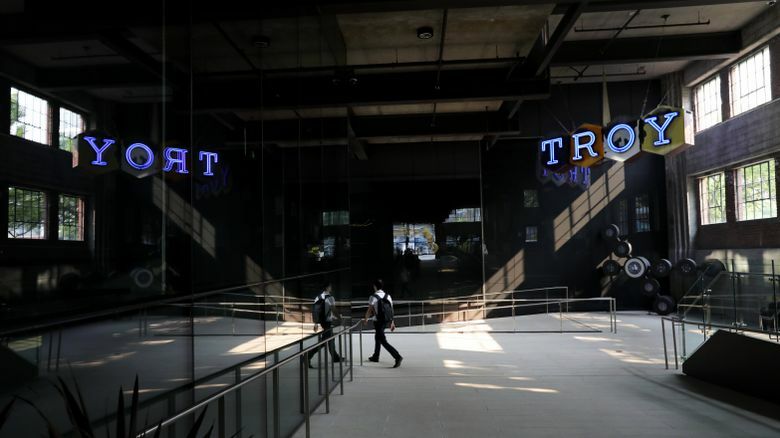 Fisco said the company believes it is entitled to insurance coverage under policies it had in place with Travelers Insurance, Liberty Insurance and Allianz Insurance. The Times filed a lawsuit against all three, which was put on hold pending the outcome of the litigation involving the contamination. “We will now ask the Court to lift that stay so we can proceed with this suit,” Fisco said. “As to the financial awards included in the decision, we have a judgment against LeatherCare for $1.85 million and claims by Touchstone against the Times were eliminated via Touchstone’s judgment against LeatherCare,” he added. A LeatherCare official declined to comment on Zilly’s order, and attorneys for LeatherCare did not respond to messages. Still to be determined are attorney fees and costs that Touchstone is eligible to collect as the prevailing party, and how those might be allocated between The Times and LeatherCare. Zilly determined that to the extent that future costs relate to groundwater treatment, regulatory review or operation of the injection wells, the costs would be shared between The Times, LeatherCare and Touchstone under a percentage formula. As to any other remedial activity that can’t be anticipated, Zilly declined to determine what equitable apportionment might apply. CORRECTION: A previous version of the headline on this story imprecisely stated that a federal judge ordered The Seattle Times to pay millions to a developer in environmental cleanup costs. The opening paragraph repeated the language, saying The Times was ordered to pay $3.4 million in cleanup costs. While the judge did find The Seattle Times and a leather-cleaning company, LeatherCare, responsible for the cleanup costs, the judge found The Times had already paid more than its share and ordered LeatherCare to reimburse the Times for the difference of $1.8 million.